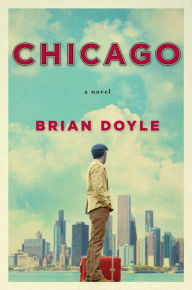 Brian Doyle's novel, Chicago, is a brave book. It's a passionate, wistful love letter to a revered city...that includes a friggin' talking dog. It's hard to imagine Bellow or Cisneros, Roth or Wright, making that choice. But of course dog-as-character is a metaphor — for the diversity of the city itself, and eventually, for the attachment our narrator feels to it. And your ability to enjoy this novel will hinge almost solely on whether or not you can get past the fact that there's an anthropomorphized animal in an otherwise realistic novel. I was warned ahead of time, which helped, and so I ended up really enjoying this. So consider this your warning as well. But let's back up a second: Chicago is about a young man, our first-person narrator, who moves to the city in the late 1970s (the specific year isn't important, because Doyle sort of combines events of several late-1970s years into one — the White Sox 1977 season, the Blizzard of 1979, Jane Byrne's election, etc.) to take a job as a journalist for a Catholic magazine in the Loop. He spends his free time exploring Chicago's neighborhoods with the dog Edward, who knows everyone and everything about Chicago. Frankly, it's a story that's a bit short on story: Our new Chicagoan makes friends, plays basketball with gang members, hangs in blues clubs (like Kingston Mines), goes to White Sox games, helps his landlady out of a jam, plays matchmaker, and falls in love himself. But mostly, he spends a lot of time hanging out, philosophizing, and being shown the sites and the people with Edward, the stamp-collecting, Abraham Lincoln-obsessed talking dog. As is the case with Edward the dog, whether you like this novel will depend on your reaction to several pages-long "thought bubbles" from the narrator himself, as well as soliloquies by various characters the narrator meets and befriends: The building manager of his Lakeview apartment building, who is Edward's owner, but in stark contrast to Edward, barely leaves the apartment, the mailman, a bus driver, etc. Sometimes, these are so eloquent they give you chills (a particularly beautiful one about the blues, for instance), as the narrator tries to identify the soul of Chicago; what makes Chicago the most American of American cities. Sometimes, however, these feel a bit overwritten or just seem like odd tangents that don't add much to the overall piece. But the latter are definitely fewer and farther between than the former. So, if you're a Chicagoan, and you're attached to your city, as I am, this is highly recommended. It's certainly not Augie March, my personal favorite classic Chicago novel, but it's a solid addition to the overall Chicago canon. I so want to read this book. I didn't realize it included a talking dog, but now that I know, I want to read this book even more.